One day soon, I’ll get around to doing a “day in the life” for WIAW, as I originally had wanted to do for this week, but, the life part of “day in the life” got in the way and I failed to take pictures of anything besides my food. Have no fear, you’ll still get to see everything I ate last Thursday. But, since there’s usually a story (boring as hell, yet still a story) behind every plate of food, I’ll try to fill in some of the blanks, in case you happen to be wondering what’s going on behind the scenes over here in my world. This is just me guessing though, so I take no responsibility for mixing up last Thursday with, say, today. It all starts to blend, really, it does. 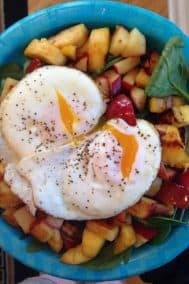 Breakfast – This was a no-run day for me, but that’s never stopped me from eating a good sized breakfast complete with a fancy little fried egg to top it off. 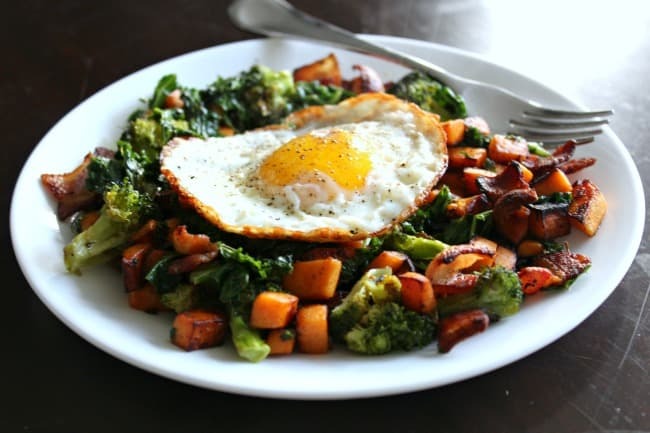 This was a sweet potato bacon hash with kale and broccoli. Double greens are rare for me but I’m pretty sure it was because I was nearly out of kale and wanted something other than spinach. This was not the last time I ate broccoli on Thursday, I guess it made a good impression on me. Behind the scenes, I’m most likely whining about cooking 3 different meals for 3 different kids, attempting to read/comment on blogs, and burning something on the stove. I’m just guessing, but that scene happens at least 4 out of 7 days per week. After the kids went to school, I most likely drank coffee, but, did not take a picture. Coffee making is usually rushed, then I drink it in spurts, and sometimes don’t completely finish it until after lunch. Snack – This was the day I baked (for the first time) a new recipe for big soft chocolate chunk cookies. These were first made with sunflower butter, but I’ve since tested the recipe with almond butter and cashew butter, for the sake of accurate representation, and also because they turned out really flipping good. 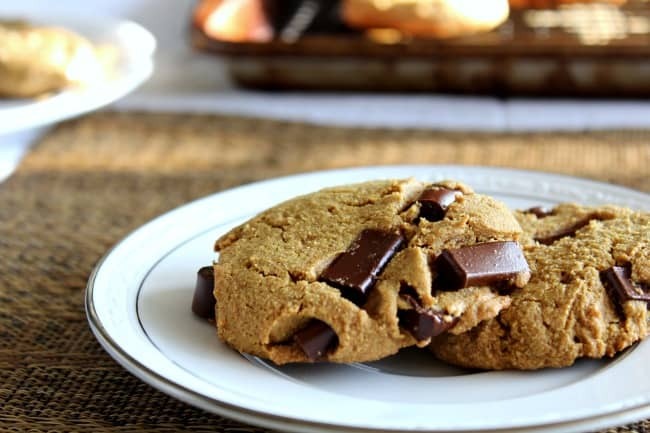 During the photoshoot, I ate one cookie plus some batter, plus maybe a spoonful of sunflower butter. The spoon has to get clean somehow, right? And I hate seeing delicious creamy sunflower butter go down the drain. Lunch – Lunch was late today since I was full from my snack, so I ate this around 1:45pm I think, before picking Drew up from school. 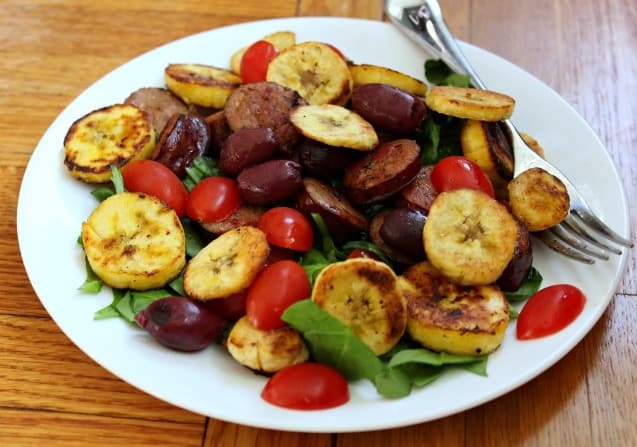 It’s spinach, tomatoes, andouille sausage, olives, and fried plantains. Super quick to throw together and very tasty and filling. Between snack #1 and lunch, I worked on my blog post for Friday, which was my recipe for a delicious savory Butternut Sausage Bake with Kale. Definitely check that one out if you haven’t already! Snack #2 – This is probably not the actual cookie I ate for snack #2, but then again, it might be. When my kids got home from school they were super excited to sample the new cookies I baked, so before heading off to after school activities we each ate a cookie. They ate some fruit too, but this is my WIAW so not relevant. It might be time for a kid WIAW soon! Dinner – We get home on the later side on Thursdays, so I do my best to make as much of our dinner ahead of time so we don’t have to wait until 7pm to eat. We ate right around 6:30 on Thursday. This was a boneless chicken thigh seasoned with sea salt, onion powder and smoked paprika, cooked in Kerrygold butter. I love cooking chicken thighs in butter lately! 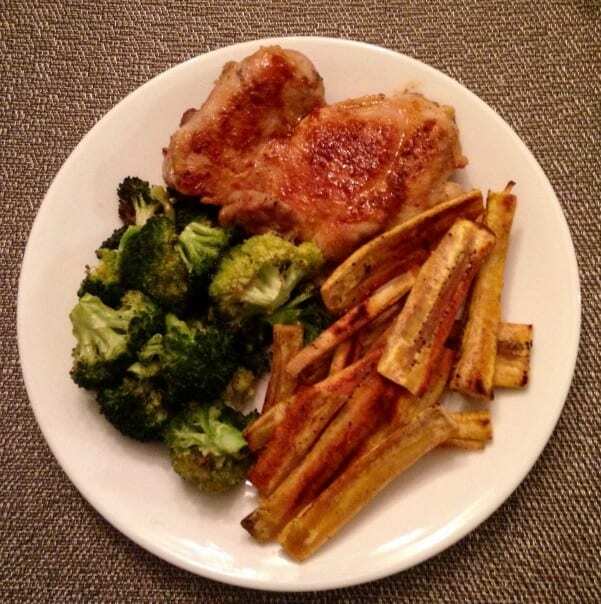 Actually the plantain fries are also cooked in butter – I’ve been cooking with butter whenever it’s not bacon fat. The broccoli I believe was roasted in olive oil with sea salt. Did I relax with this dinner? No, not at all. Dinner is the least relaxing meal of my day and generally the hours from 4-8pm are the most stressful. I usually make myself my own bedtime snack at the same time I make my kids’, but then don’t eat it until after they’re in bed, preferably asleep! Honestly, I’m much happier eating in general when I know I won’t be bothered. Especially when I’m eating chocolate. 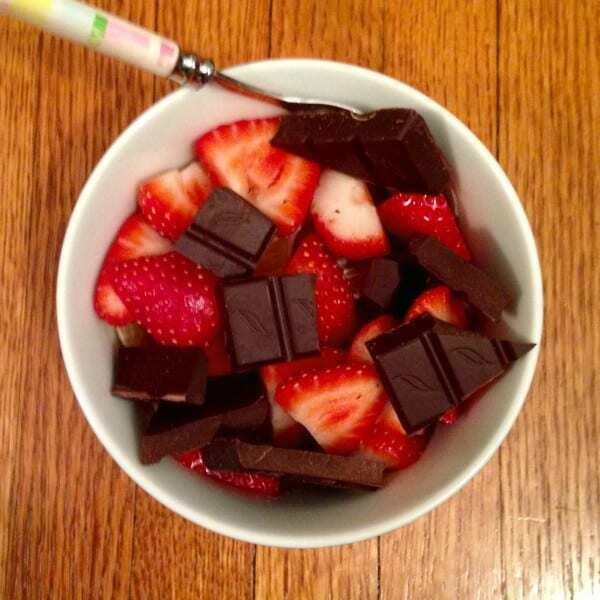 Chocolate is so much better uninterrupted, right? What time of day do you have coffee? If you have kids, do you eat with them or eat later on? What’s typically the most relaxing meal for you? For me, lunch! Early morning = coffee. I go to great lengths to keep it that way. Ha! It has always been a family goal to eat together as often as possible especially dinner. When out kids got older our goal changed to more nights than not in a week we eat dinner together. Now, our kids value the time and realize the importance. Cookies 🙂 The nights when Adam is home (really just weekends!) I enjoy our family dinners more since he can help with cleanup. Once they’re a little older I will get the kids on board so we can all enjoy it more hopefully! I try to eat my snack at night when my son is busy doing something else too lol. I am drinking coffee right now. I usually drink a few cups in the morning (lots of decaf). I used to like one in the afternoon after lunch but not anymore it seems. I would always rather wait to eat until I know I won’t be interrupted! Even though I usually multi-task while I eat, I don’t like to be running around- for some reason if Im just working on my computer while I eat it still seems more relaxing to me! And I always have my first cup on coffee when I wake up and read blogs (like right now) and then another cup when I get to work around 7:45. I’ve never had sunflower butter. I really need to try it. Lately when I drink coffee it tends to get cold really fast and I hate cold coffee so I end up warming it up at lunch to finish it. Too lazy to get up from the computer! I keep my coffee in an insulated cup no matter what, but even still I usually have to reheat it. um…mid shoot eats are totally necessary! Hahaha how funny about the day in the life and all the photos are food- I can totally relate! I take it as a good sign if I can’t help but eat whatever I’m taking pictures of! I love sunflower butter. I think that breakfast is my most relaxing meal. I am having my (half caff) coffee, reading my blogs, it is just very peaceful. That’s sort of what lunch is like for me when the kids are at school! Oh my goodness those cookies look perfect! The most relaxing meal of my day is honestly probably breakfast because my work schedule is so flexible that I can finish up and mosey on in whenever I’m ready. It’s also where I drink my beloved 2 cups of coffee. Thanks! Having a relaxed breakfast sounds soooo nice! Before kids I definitely ate dinner while watching TV and it was my favorite time of day! Now they watch TV and I yell at them to do homework, clean up, etc. Love chocolate chunks! My local grocery store had Enjoy Life chocolate chunks in bulk on sale – crazy! I think breakfast is the most relaxing meal of the day or dinner. 😉 And those cookies. YUMM! I would love a relaxing dinner once in awhile but I suppose I’m used to it this way now! And coffee is around 10-10:30am for me!! Yummm those cookies look so good! They’re tempting me to bake today. I usually have my first coffee before I run and then a cup with breakfast and another cup around 10. I drink a lot of it! My most relaxing on weekends is breakfast/brunch if I’m by myself – catching up on blogs from the past week, hopefully reveling in a running/relaxing day with no work. During the week I guess it is also breakfast if it’s a slow morning in the office, or dinner if I leave earlyish! Relaxing brunch sounds just soooo nice right now! Those cookies look incredible. I always have coffee first thing in the morning. I love that you used the word “spurts.” It’s one of my favourite words. Being able to relax while eating is certainly something I take for granted. I eat slowly and know when kids come along that may change. Plus I really like to enjoy my desserts if I’m having them so I would definitely wait till kids were asleep! If possible of course. I love my coffee in the morning, but usually sip it until lunch! I work really early so I have breakfast at the crack of dawn by myself. I love that time of day that I can just read, catch up on blogs, sip my coffee in peace! Oh gosh that scene sounds like heaven! Those cookies look FABULOUS. Recipe? Ugh, you were in spam for days! I un-spammed all the comments but hope it’s fixed now. 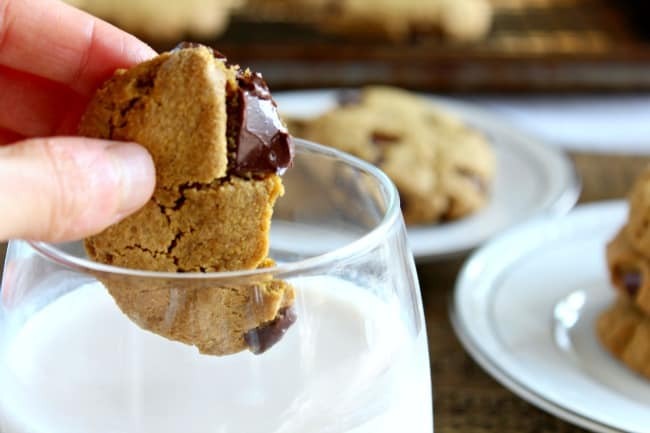 Those chocolate chunk cookies look amazing… I want to try the version with almond butter. Actually, scratch that. All versions sound amazing. I’m anxiously off to find that recipe! I love the idea of doing a kids’ WIAW! I think other bloggers should join in and do it, too. Alternate/additional version being a WIAW for a spouse or s/o. 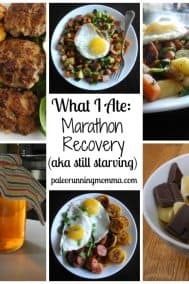 I love eating my snacks/desserts when I’m uninterrupted and not distracted! It makes me happy to see your olive love going strong. I have no idea what’s going to happen to me after the tiny human comes.